FACT CHECK: Sarah Sanders Makes False Claim On African-American Jobs Under Obama The White House backtracked this week on claims that President Trump has overseen more job gains among African-Americans than his predecessor, Barack Obama. 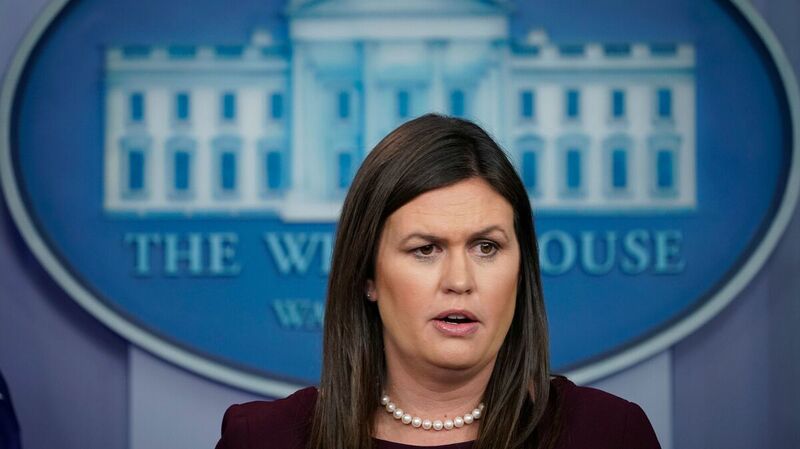 White House press secretary Sarah Sanders apologized Tuesday for wildly misstating employment numbers for African-Americans under former President Barack Obama. White House press secretary Sarah Sanders tried to rebut that claim by arguing that Trump has done more to boost African-Americans' economic status than his predecessor. But her job statistics were as bogus as Trump's long-debunked claims about Obama's birth certificate. "This president, since he took office, in the year and a half that he's been here has created 700,000 new jobs for African-Americans. That's 700,000 African-Americans that are working now that weren't working when this president took place. When President Obama left after eight years in office — eight years in office — he'd only created 195,000 jobs for African-Americans. President Trump in his first year and a half has already tripled what President Obama did in eight years." First, let's stipulate that presidents by and large don't "create" jobs. The strength or weakness of the job market depends on numerous factors beyond the control of the White House. But fairly or not, presidents are often judged by how the economy performs on their watch. So let's examine Sanders' numbers. She was right about Trump's record. According to the Bureau of Labor Statistics, there are about 700,000 more African-Americans working now than when Trump took office — 708,000 more, to be precise. But when it comes to Obama's record, Sanders is off by a factor of 15. According to the BLS, there were 18.4 million African-Americans working when Obama left office in January 2017. That's 2.9 million more than when he was sworn in eight years earlier. Once reporters pointed out the error, Sanders issued a rare, albeit grudging, correction on Twitter. "Jobs numbers for Pres Trump and Pres Obama were correct, but the time frame for Pres Obama wasn't," Sanders wrote. "I'm sorry for the mistake. But no apologies for the 700,000 jobs for African Americans created under President Trump." So, is there a different time period for which the 195,000 figure Sanders gave for Obama would be correct? The number appears to be drawn from a chart compiled by the president's Council of Economic Advisers, which showed job growth for the 20 months following each of the last three presidential elections (including November and December of the year the election was held). From November 2008 until July 2010, 636,000 African-Americans lost jobs, as the nation sank into its deepest recession since the great depression. Four years later, in the 20 months following Obama's re-election, 831,000 African-Americans found jobs. Adding those two periods together produces a net total of 195,000. But this is a curious "time period" in which to assess Obama's record — the 20 months following his 2008 election, added to the 20 months following his 2012 re-election, ignoring the periods in between and afterwards. On Tuesday night, the CEA apologized for what it called its "earlier miscommunication" to Sanders. Perhaps a more reasonable yardstick with which to compare African-American job gains during Trump's first 18 months in office is what happened in the 18 months just before that, from June 2015 through December 2016. According to the BLS, 793,000 African-Americans found work during that period. In other words, about 85,000 more African-Americans found work during the 18 months before Trump took office than the 18 months since. The pattern is similar for the broader population. In the 18 months since Trump was sworn in, the U.S. has added 3.4 million jobs, about a quarter-million fewer jobs than were added in the previous 18 months. In no way is this to discount the strong job gains generally, and among African-Americans in particular, that the U.S. has enjoyed under the Trump administration. But those gains appear to be little more than a continuation of the healthy trend that Trump inherited. And no matter how much this president tries to reverse and discredit the legacy of his predecessor, the numbers are plain to see.